The White River and Yampa River (with its main tributary, the Little Snake River) together contribute about 15% of the flow of the Upper Colorado River Basin.With relatively few dams and diversions, they have a largely unimpaired flow regime and provide regionally important habitat for native fish, including the four endangered species in the Upper Colorado River Basin. The White and Yampa Rivers also comprise nearly all of the streamflow within the state of Colorado that is still unappropriated and legally available for consumptive use. Thus, these rivers are increasingly attractive to those seeking new water supplies, to serve both urban water use on Colorado's Front Range and energy development on the Western Slope. Steve Gray, with Jeff Lukas and Connie Woodhouse, used a network of existing tree-ring chronologies to generate streamflow reconstructions for the White River, the Yampa River, and the Little Snake River (Gray et al. 2011). The Little Snake River near Lily, CO, gage, represents the flow of the Little Snake River just before it joins the Yampa River. Figure 1. 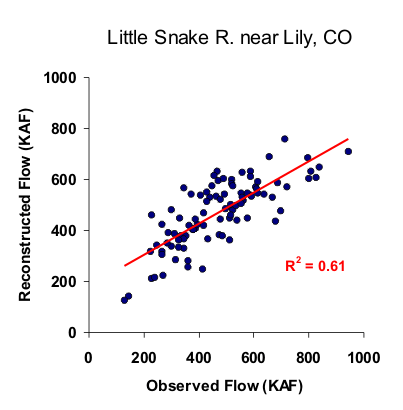 Scatter plot of observed and reconstructed Little Snake River annual flow, 1906-2001. Figure 2. Observed (black) and reconstructed (blue) annual Little Snake River annual flow, 1906-2001. The observed mean is shown by the dashed line. Figure 3. Reconstructed annual flow for the Little Snake River (996-2001) is shown in blue. Observed flow is shown in gray and the long-term reconstructed mean is shown by the dashed line. Figure 4. The 10-year running mean (plotted on final year) of reconstructed annual flow for the Little Snake River, 996-2001. Reconstructed values are shown in blue and observed values are shown in gray. The long-term reconstructed mean is shown by the dashed line.